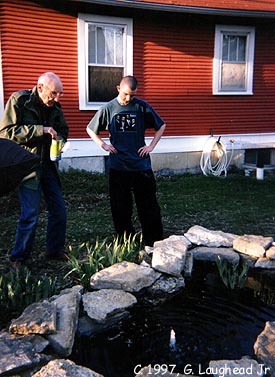 William S. Burroughs and Daniel Diaz feeding fish outside William's south bedroom window. Photographed March 26, 1997, by George Laughead. Also see: "Shooting Joan Burroughs" Beat Generation writer William S. Burroughs at home, Lawrence, 1997. UFOs and Joan Vollmer Burroughs death. Return to the Beats In Kansas or to the Kansas Heritage Group or to the WWW-VL: History: USA 1960s History.